This breathtaking herb reminds me of royalty…even the Latin name “Verbascum thapsus” has a regal air! In the first year of growth, anytime from spring until fall, a crown of thick furry flannel-like leaves grows in a layered rosette. In the second year the crown of leaves grows majestically up from the ground. Around the summer solstice, mullein sends up a long slender spire and gradually adorns it with bright yellow flowers. Verbascum is a visual delight and a beautiful addition to both wild and cultivated gardens. Mullein attracts a wide variety of pollinators including bees and butterflies whose survival is threatened as their natural food sources are replaced by exotic foreign plants, large weed-free lawns and expanding urbanization. Mullein loves dry, sunny conditions and relatively poor soil, making it perfect for a drought-resistant garden! Natives taught the early settlers about the many virtues of smoking mullein leaf, as they had, in order to protect their lungs from their smoky environment. 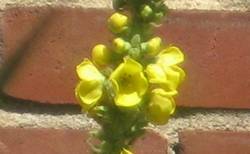 Several studies have supported the expectorant*, and anticatarrhal* effects of mullein. 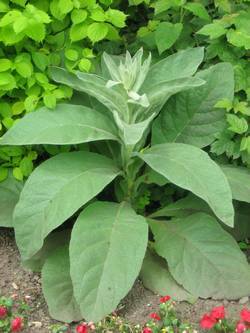 The taste of mullein, dried, crumbled and smoked in a pipe, is a lot like American tobacco but instead of the negative effects associated with smoking tobacco, mullein actually improves respiratory function. (It’s not easy to get our heads around that concept in our anti-smoking culture!) 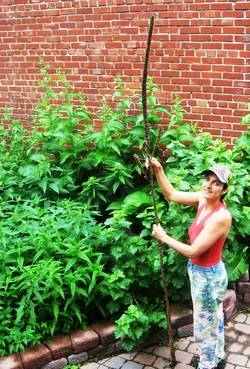 Mullein leaves can also be tied together in a bundle, or smudge stick. The smoke from the burning smudge can be inhaled for the same benefits. 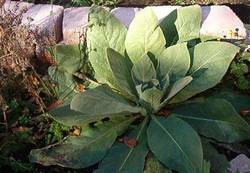 My friend Nicole tinctures mullein leaves in alcohol and has been impressed with the relief it has brought to her family’s chest colds and unrelenting coughs. If children are going to be taking this remedy you could also infuse the chopped mullein leaf in pure vegetable glycerin instead of alcohol for toning the mucous membranes of the respiratory system. The flowers also make wonderful medicine. When my boys were young they’d count the flowers on mullein’s stalk each morning and run back upstairs declaring how many had blossomed overnight. I think the record was fifteen but generally each plant can intermittently produce about a hundred flowers. We’d put the tiny flowers in a small jar (the little British jam jars are perfect) and cover them with olive oil. Each dry day we’d add the daily harvest until the jar was filled with flowers. Over the next six weeks the antimicrobial*, anti-inflammatory*, pain-relieving constituents would be extracted into the oil. After carefully straining the oil through a cloth filter, we would use it for those dreaded childhood ear infections. Amazingly, the boys would lie still for twenty minutes while the drops (usually five or so, every few hours) of warmed mullein oil worked their magic… without the side-effects of disturbing their immune or digestive systems. After a day or two of treatment the boys would be up and running. (Please consult your health practitioner before treatment to ensure that the eardrum isn’t perforated). You can add essential oils of eucalyptus, lemon balm and/or thyme to your mullein oil and massage it into your chest, back and throat for lung congestion and persistent coughs. We also use mullein oil externally for painful, inflamed joints and for sports injuries. 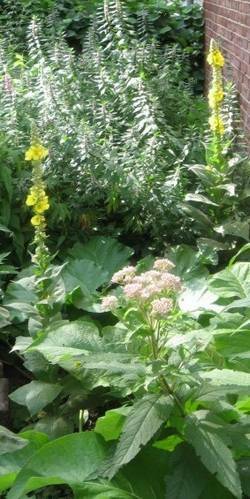 In medieval times mullein stalks were immersed in suet or wax and used as torches. (If you try making your own mullein torch be sure to place it in a pail of sand or in the ground so as not to be burned by melting wax or sputtering suet!) Natives valued the length and strength of the dried mullein stalk as a hand-drill when making friction fires. A hand drill has two parts: a fireboard, which is a flat piece of wood, (ideally cedar) with a small depression carved into it; and a spindle, the straight, narrow stalk of the dried mullein, whose end fits into the depression on the fireboard. To create a spark, rub the spindle rapidly between your hands, or using a bow, in order to produce enough friction to get past the smoke stage. Have a tinder bundle ready to light your coal. With a good amount of force, endurance and speed mullein stalks can help you stay warm in a survival situation. I leave the stalk standing in my wild garden over the winter hoping that several seeds will sprout in the spring. No matter how many seeds may fall Verbascum always seems to prefer growing on my front lawn where there’s a generous supply of carbon monoxide.. a favourite food source according to Susun. I agree with her theory as I enjoy the stunning sight of multitudes of mullein plants growing along the highway in July and August. Even traveling along at 100 km/hr mullein’s yellow crowned stalks grab my attention! I hope mullein graces your garden from this Summer’s Solstice to the next, and allows you and your family to breathe (delight)fully! Over the years I have been blessed with many inspirational teachers. I thank them for sharing their wisdom through their lectures, workshops, websites and books. For more information about Mullein and many other healing herbs, enjoy these insightful and informative resources.